This week’s Sunday Sevens is a couple of week’s worth as I haven’t had chance to get near a computer before now. To find out more about Sunday Sevens, visit Nat at Threads & Bobbins. 2. This was the ‘before’! 3. All No.3’s curls have gone! N0.3 wanted me to cut his hair ‘long’. 4. 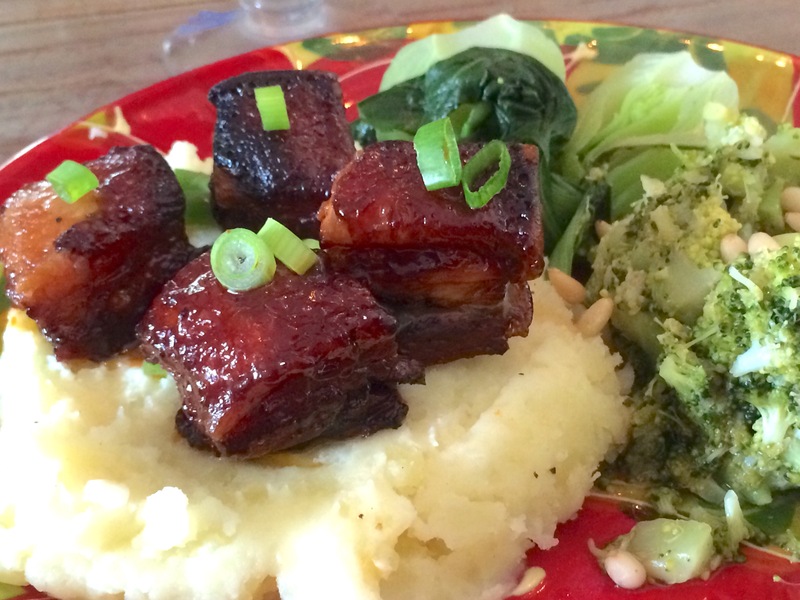 The Boys are eating the crackling, which I cut off the pork belly before cooking what is possibly the tastiest meal ever. 5. I managed to get around to making a friend’s curtains which she has been waiting for for ages. 6. 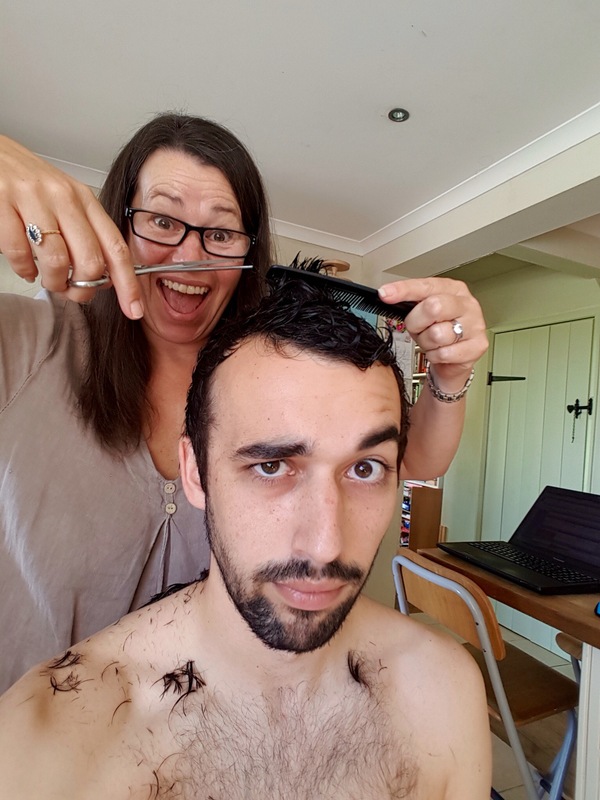 No.1 Son also wanted a haircut before we all went camping. I did the ‘Mad Woman Let Loose With A Pair Of Scissors’ impression. 7. 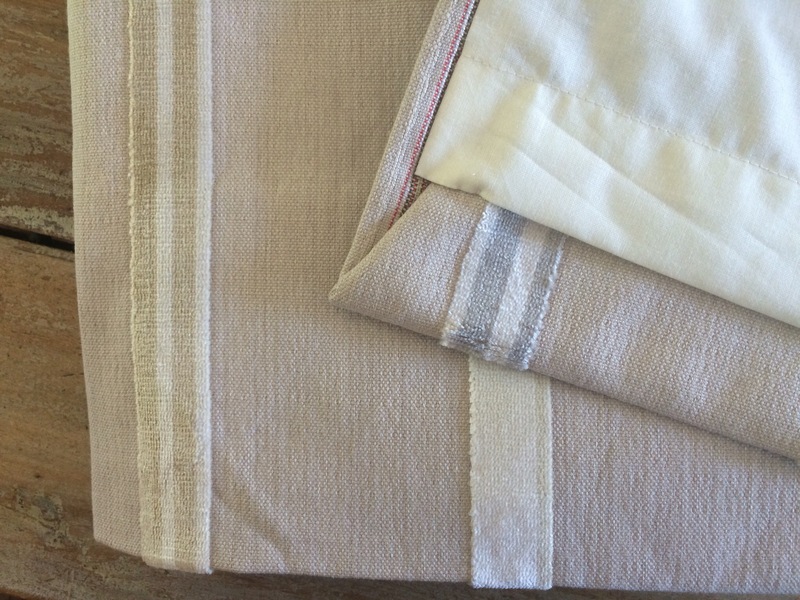 I whipped up some simple bunting for the tents using some scraps out of my ‘less than 4″ square scrap bag’. Come on, I know I’m not the only one who can’t bear to throw away even the tiniest piece of fabric. 8. Talking of camping, No.1 Son went a day earlier and took both the tents as there wouldn’t be enough room in my little car (Mr H-L’s big car was in the garage). 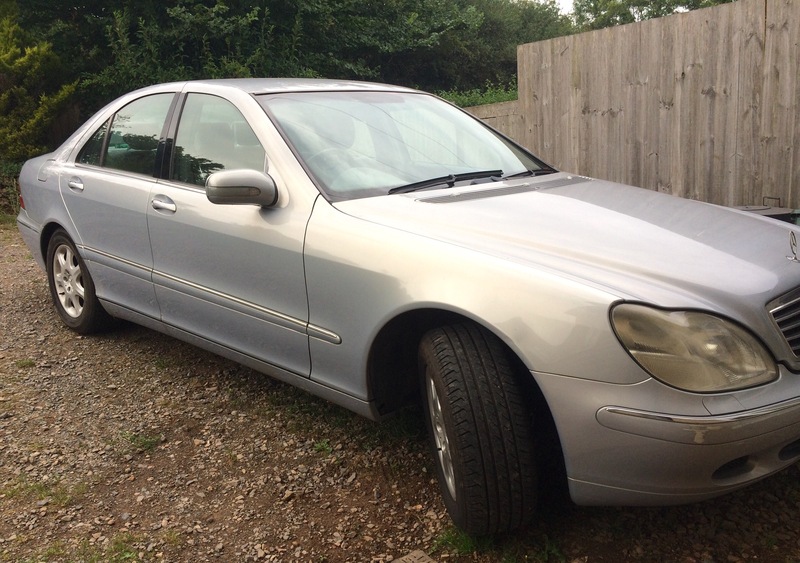 At the last minute, the garage rang to say they’d fixed the Merc. Bonus! 9. Camping with all three sons and N0.1’s girlfriend. 10. Everyone needs a bit of bunting on their tents. And homemade picnic rug and crocheted blankets. 11. 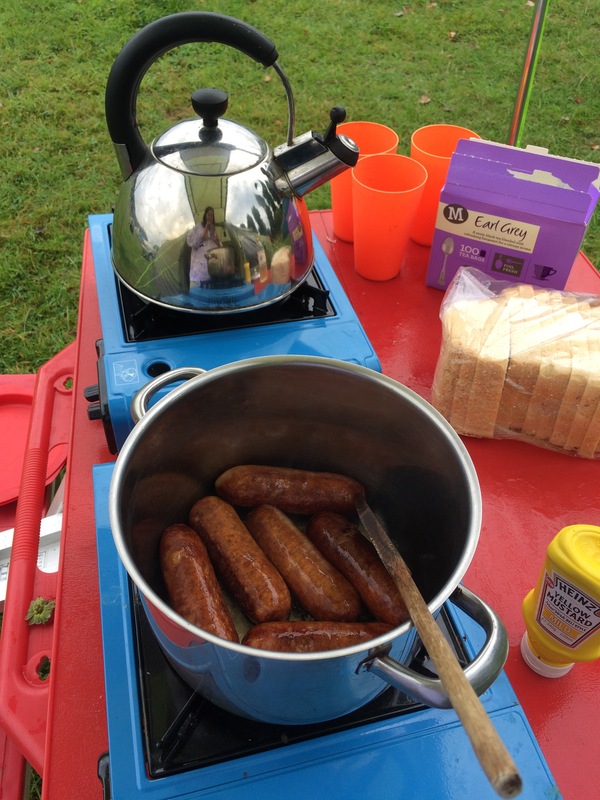 Standard camping breakfast – sausages! 12. Family selfie at Hurlstone Point overlooking Porlock Bay. 13. 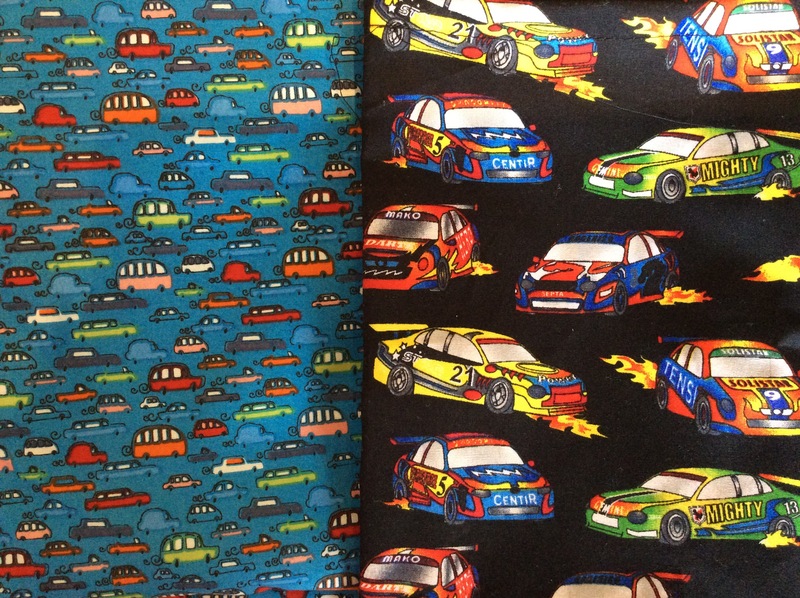 The Boys chose their own fabric for their sewing lesson projects. 14. Hanson’s fabric warehouse in Sturminster Newton was in the midst of putting up all manner of things outside their shop for Yarnbombing Day. 15. 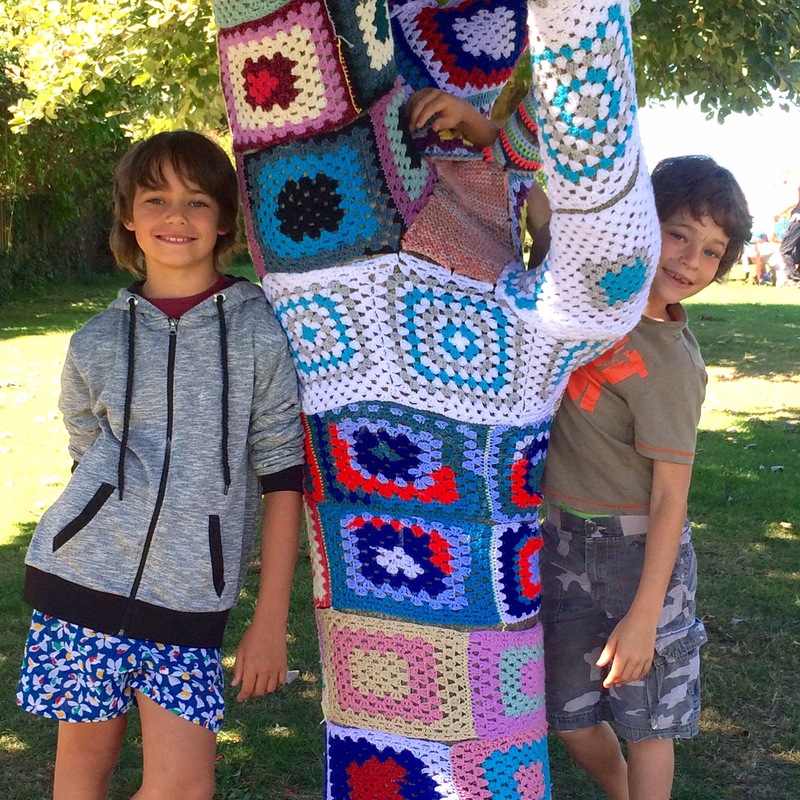 The nearby open spaces were also duly adorned with knitted and crocheted works of art. The Boys couldn’t resist touching everything. 16. I’m still working steadily on the knitted baby shawl. At this point I think I was two thirds of the way in with 60 hours under my belt and over 70,000 stitches to date. 17. The Boys went back to school, everyone went back to work and I went to the café all on my own for a bit of peace and quiet and well earned coffee and cake. Categories: Knitting, Sewing, Sunday Sevens | Tags: baby shawl, bunting, camping, haircuts, knitted shawl, Sundaysevens, yarnbombing | Permalink. Haircuts all round. 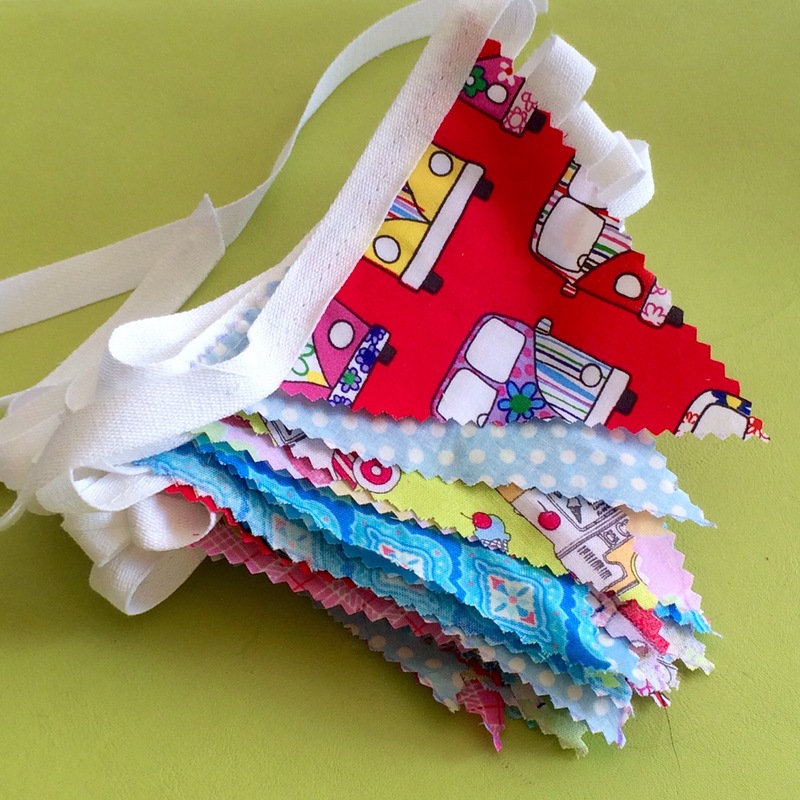 That bunting is so cute and looks fabulous in situ, what a lovely, homely camp. Thank you – all that crochet and bunting is just made for camping, isn’t it? Loved these pictures! 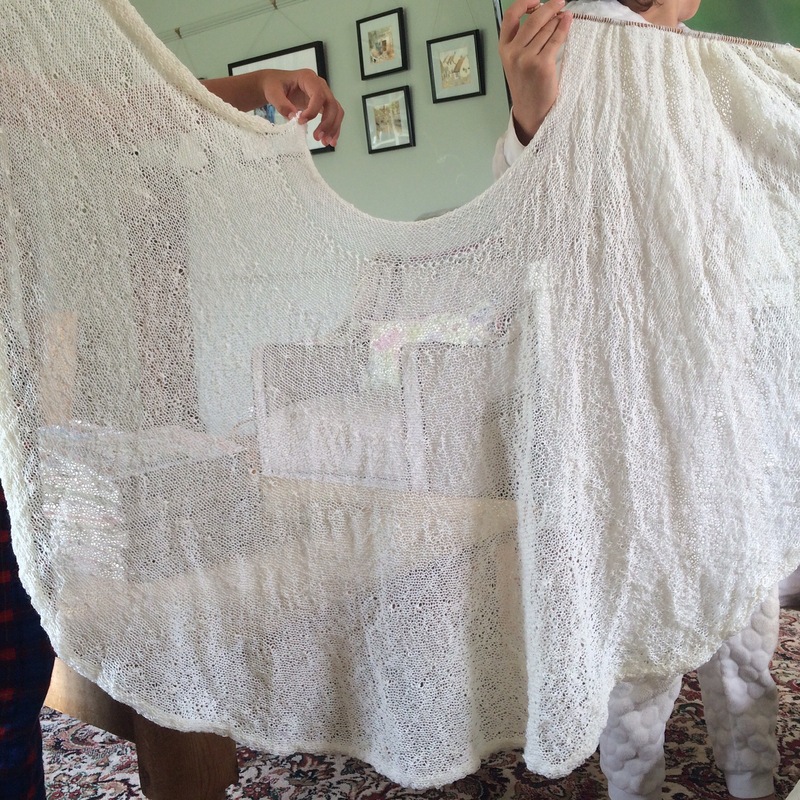 I’m so impressed with your baby shawl! Such patience. I am still working on a triangle shawl that seems like will never be done. Thankfully there are chunky crochet projects to get me through. 😀 ❤ Glad you had a lovely week! The shawl is hard going, if I’m honest, but I do break it up with other things, mainly sewing, which are quick little projects. I’m not sure my hands would cope with anything chunky after all this laceweight knitting! I do love yarnbombing. And I love camping but I’d think my fellow campers would roll their eyes at me if I whipped out the bunting. Such party poopers. Ha ha! My 23 year old son rolled his eyes when I turned up with the bunting! He didn’t say no to a crocheted blanket when sitting outside in the evenings, though, funnily enough. Blankets are a camping essential! I loved the yarnbombing. Seeing that lets me know that Yarndale is on its way. The boys getting their hair cut are so special. The baby shawl looks so fragile. Camping is always so fun when you have what you need. 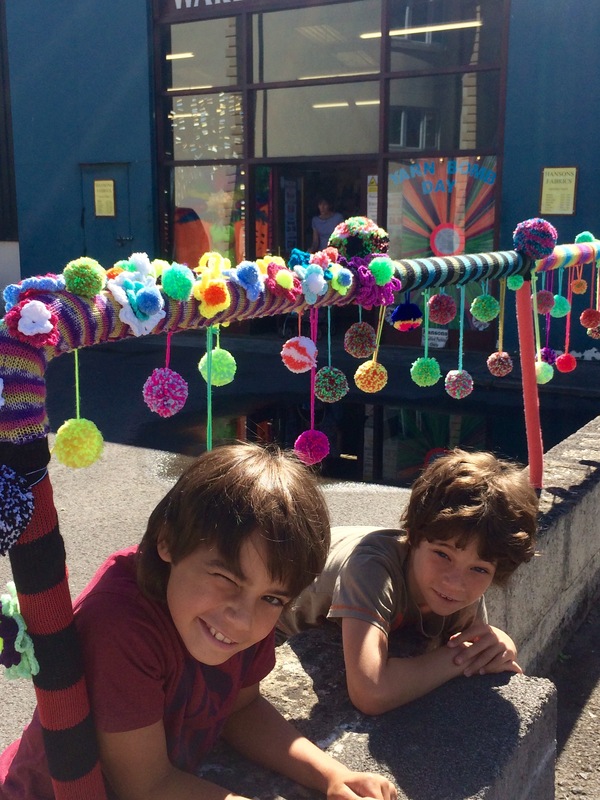 I agree – yarn bombing seems to make everyone smile as they walk by, most being unable to resist the urge to touch it. Camping was as much fun as we knew it would be, but I’m glad we took the crochet blankets as the evenings were quite cool. LOL!….after such a hectic fun packed time…’and breathe!’ 🙂 Forgot to mention before ~ fab bunting from your saved scraps! That looks like very ‘posh’ camping – hand made bunting, crochet blankets, some wine to keep the evening chill out and Earl Grey! I could almost be tempted. The camping looks even more fun with the bunting & blankets! We took lanterns with church candles, too – even more fun! 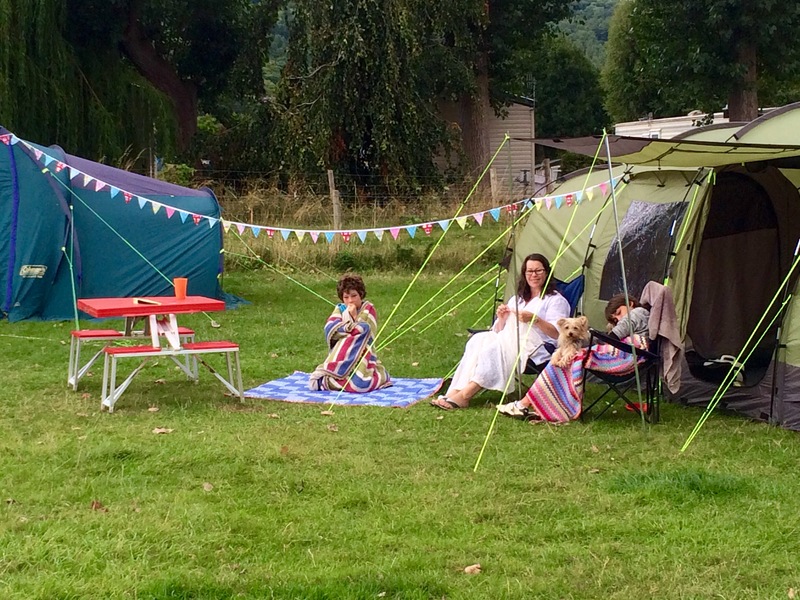 Fantastic family time & a very stylish camp with the bunting & blankets! 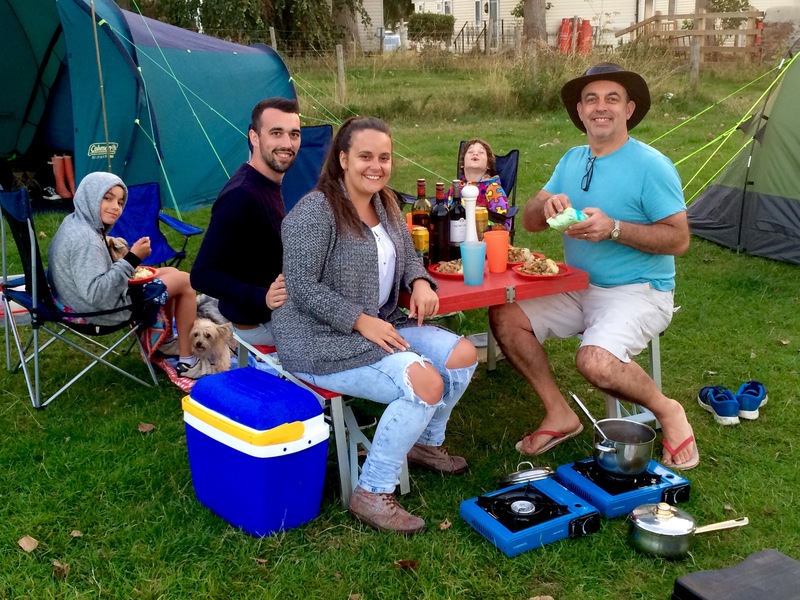 Thank you – camping is the ultimate way to have quality time with the family, isn’t it? It’s so good for children to grow up with camping as an experience as they get so much from it. My grown up children now go camping on their own to the very same sites that they loved so much as kids. No doubt they’ll take their children one day, too. 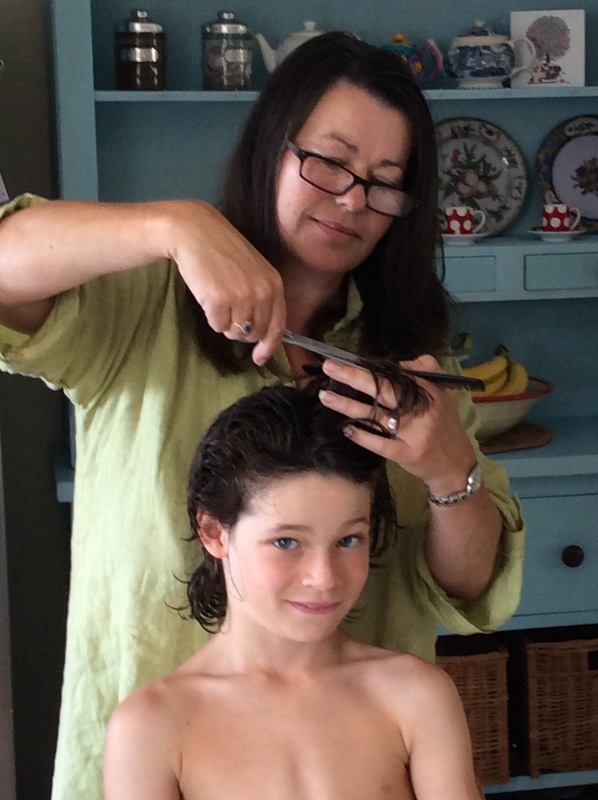 That’s why I keep their hair long – I’m not a trained hairdresser and this way the wonky bits don’t show. Camping was fab, thanks – as always. We love it. Fantastic week. I love your campsite, so cheerful and relaxed. Even the dogs are having a blast. I love the baby shawl, it is prettier each time I see it. We all just adore camping, it must be in our blood. Which son? Presumably you mean No.1 Son as the baby seems to have come from another planet, what with his fair skin and blue eyes! lol. No, the little one. He is adorable. (the baby one) he has your mouth and look in the eyes. They are all very sweet, but this photo just seems to “pop” when you look at him. Glad you love camping. We have a promotion here this week with free access to our National Parks. I guess we are definitely going for a visit to one at least. Your pic of cutting no. 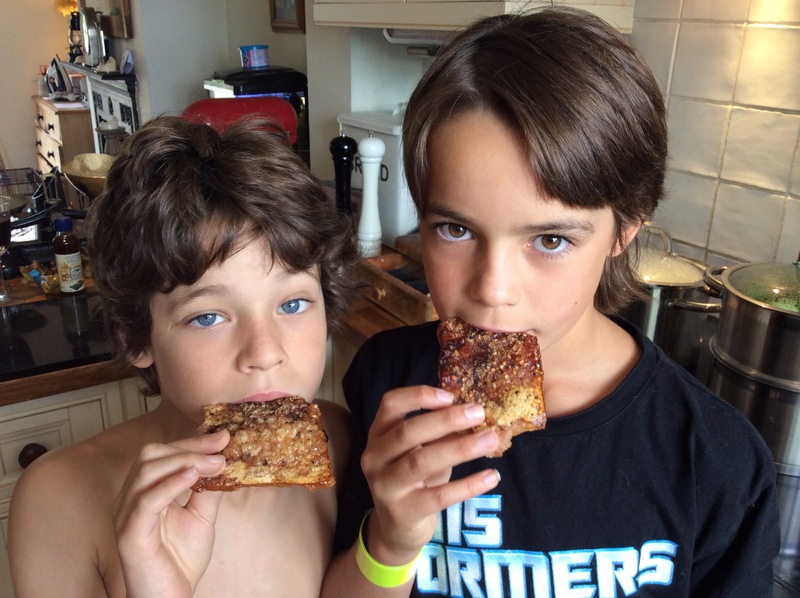 1 sons hair is my favourite from all,your Sunday sevens! I think you should have it printed on canvas, it’s fab! Lovely catch up of everything, I’m so behind. 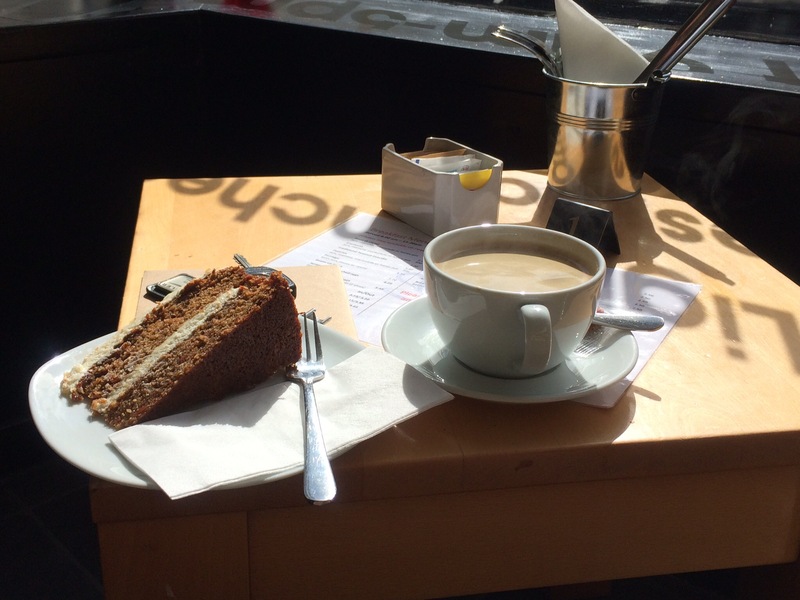 Coffee and cake alone – I really get that, me time needs to be found in order to retain sanity. And glad the merc has been able to get fixed. Mine unfortunately went to the Merecedes graveyard last week ☹️ So I’m car less at the moment, but luckily hubby has been able to lend me his and he’s borrowed something else from work. Thank you – you’ve got to have fun!